MUFF WIGGLER :: View topic - Quad VCA response - Lin or Log? Quad VCA response - Lin or Log? 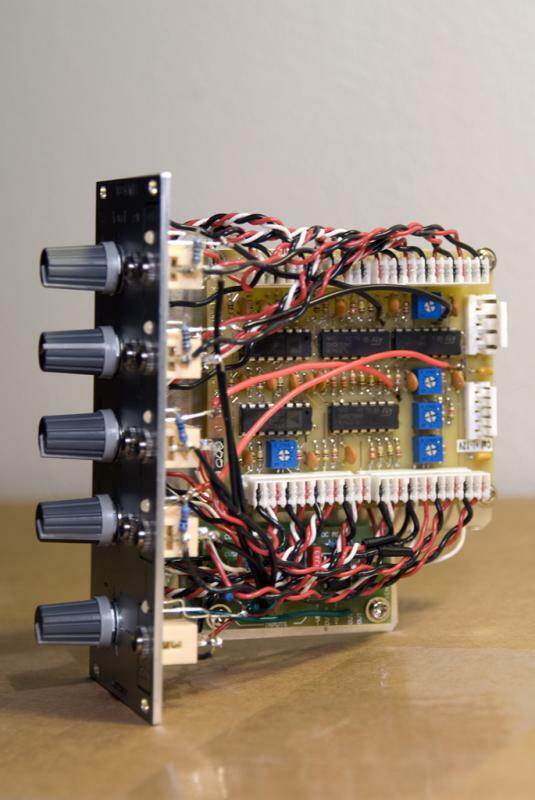 I'm thinking about getting a Quad VCA PCB and maybe wiring the outputs so they're normalled to the inputs of a mixer. 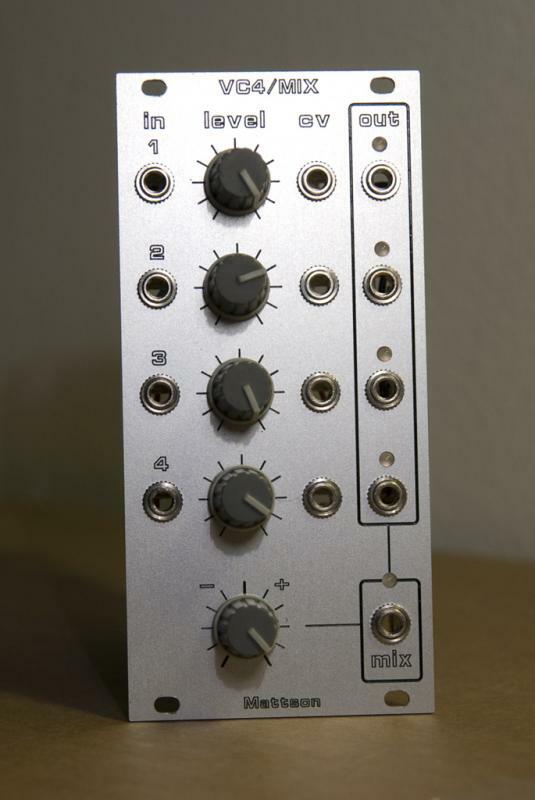 Seems like a great multiple VCA / VC-Mixer solution for Eurorack. Is the response of each VCA Linear or Logarithmic? A couple of guys on here have done that. Or, something similar where they grab a quad VCA and a quad VC Mixer and put them behind the same panel. Usually normalling each of the VCA channel outputs to the corresponding VC mixer channel inputs. That way, they have both hard wired together but can be seperate through patching. Since the VCA channels are (typically but, not necessarily) expecting a RC generated exponential output from an EG, the input response to the VCA CV inputs are linear. Didn't want to exponentiate too much. Maybe the guys that did this can post their results. Thanks for your reply, George! Linear response will be perfect, as the planned module would be used for processing CV (Linear), and Audio with Logarithmic/Exponential(?) RC-generated curves like you said. It'd likely pair it with one of your 4-channel Mixer PCBs, though I would like to have a 5th input (No VCA, hardwired to the Mixer summing node). Would the PCB accommodate this, or would it end up getting messy? Also, would it be possible to add an attenuator to each VCA's CV input? I've seen a few great examples in the MMM DIY thread, thanks! By the way, how much would shipping to the UK be likely to cost? That would get messy. The summing is done post VCA prior to the final buffer and inverter. Also would be hard to tap. You could if you wanted to. But the existing attenuators limit the signal input so, the output is reduced at full CV. It keeps the response smooth for the full sweep while allowing the signal to be processed to only reach specific values. I like running a 5V signal into one channel and use a pitch bend or foot pedal sending a 0-5V cv to the CV input. I set the 5V signal to only change a VCO pitch by a minor 3rd when the CV is full on and using the VCM attenuator. The next channel CV is cascaded from the previous so, on the next channel, I patch in a triangle LFO and set it to only do a slight vibrato to the VCO at full cv. When I push the pitch wheel or foot pedal that I'm sourcing the CV from, The pitch of the VCO bends up to the minor 3rd while the vibrato portion doesn't start to show up until the pitch gets close to the full bend. That's USPS small flat rate priority..
George will have to answer the question about adding a fifth pass-through input. Sounds like a good idea, if it isn't hard. It would have to be non-inverting to maintain the same phase as the other inputs. Wow. George and I answered at the same time. Thanks for the replies, very helpful! I can see now why adding CV attenuators wouldn't make much sense as the CV inputs are normalled to operate fully open, and then you attenuate the input signal. I thought the manual control would be a variable voltage offset per VCA. What's the input impedance of each VCA? Might have to use on of Ken Stone's DC Mixer PCBs. Looks like it has six inputs. Isaiah, you're on the right track. I built myself a 12hp Euro module using one of the Quad VCAs and a CGS04 mixer. I used the switching lug on the VCA's output jacks to run the signal into the mixer - so now I have a 4-channel VC-mixer and each channel can be removed from the mix and used as an individual VCA simply by plugging a cable into its output. It's very much a core module in my 18U. I'd like to un-cascade the 4 channels' CV... I want 4 fully-independent channels. Fortunately this should be easy - next time I unpatch the module I'm making the change. I'll unhook channel 2-4's CV cascade connection and run the +5v from CH1 straight in instead. White wire dance! Great work, it looks ace! That's exactly what I'm thinking - 4 VCAs with up to 4 channels of VC-Mixing! How do you have the polarising attenuator wired up? Are all the VCA outputs summed to the wiper of the pot on the Ken Stone PCB? I'd likely wire each VCA's CV input independently, so there's no cascading. You'll want the +5v normalled to all channels as that's what opens the VCA (via pot setting) when you have nothing plugged in to the CV input. Each output jack on the QVCA is wired to an input of the CGS04 mixer, meaning you will use 4 of the 8 available inputs on board. The polarizing attenuator is wired up using the OUT and 'A' (I think?) pads on Ken's PCB, one to each end of a pot. The wiper of that pot goes to the MIX jack.